In August 1914, RBGE had a staff number of 110, 88 of which were male. Within two months of Britain declaring war on Germany on the 4th August, 56 had enlisted, rising to 73 by the end of the War. The largest number enlisting in one day was on the 29th August 1914, when 18 men from RBGE joined the army, nine of these signing up with the 5th Battalion of the Cameron Highlanders. They were joined by probationer gardener James Reid who enlisted with the 5th Cameron Highlanders on the 2nd September. He and three of the earlier enlisters, Alan Menzies, John Stewart and Robert Keir, were probationer gardeners who started at RBGE at the same time in August 1913; other probationers enlisting were William Frederick Bennett, Thomas Eneas Angus, Duncan Coutts and James Murray Grant; and they were joined by implement keepers George Hugh Stuart and David Ramsey Oliver. George Stuart initially served only 60 days as it was discovered he required a hernia operation, but he was allowed to re-join the same Battalion as his colleagues when he was declared fit in December after a recommendation for re-enlistment given by Professor Francis Mitchell Caird of the Royal Infirmary, artist for the Botanical Society of Edinburgh and contemporary of RBGE Regius Keeper Isaac Bayley Balfour. George H. Stuart’s image published in the Edinburgh Evening Dispatch, November 1915. George Stuart’s records found on Ancestry.com reveal much about his life not recorded in RBGE’s records, such as his hernia operation. He was 5ft 9inches tall, had a scar on the small of his back and apparently defective teeth (a common occurrence in WW1 service records – the army provided Duncan Coutts with dentures). RBGE records show he had a wife, living at 90 Pitt Street in Leith, but his enlistment form states that he was a bachelor in December 1914. As one continues through the army forms it is revealed that Stuart married Sarah Oliver in January 1915, a lady with the same surname as her husband’s fellow RBGE implement keeper David Ramsey Oliver. Indeed, a look at Oliver’s records show him to be her brother, living at the same address, that of their parents. There could be no marital home for Sarah with her husband in the army, though they did have a son, also named George Hugh Stuart, born 27 January 1916, showing they were able to spend time together before Stuart and his colleagues left for France from Folkestone on the 10th May 1915. Stuart, along with three of his RBGE colleagues, was dead four months before the birth of his son. The 5th Cameron Highlanders landed at Boulogne on the 11th May after an overnight Channel crossing and made their way towards the Western front where they were to spend their first few months overseas keeping on the move behind the trench lines, digging in, training and often needing to be ready to move up to the front if the call came. During this time, George Stuart was disciplined for “disregarding an order whilst on active service”, confined to barracks for three days. 9th (Scottish) Div. 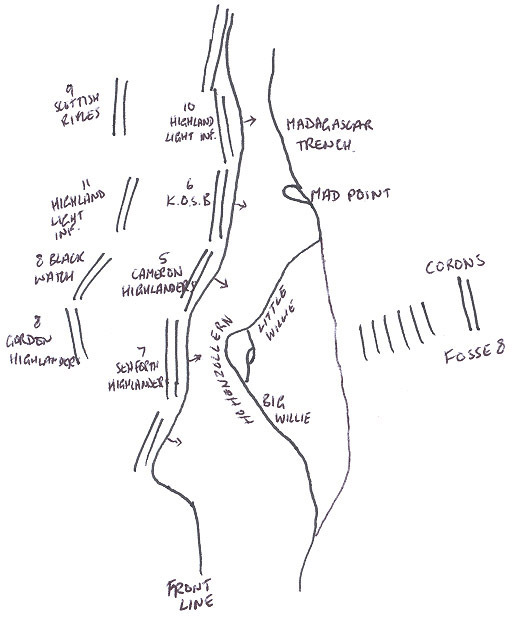 positions, 25 Sep 1915, at the Hohenzollern Redoubt, north end of Loos battlefield. HQ pushed on with the remains of D Coy and were able to take the Corons cottages relatively unopposed and “without further loss”. 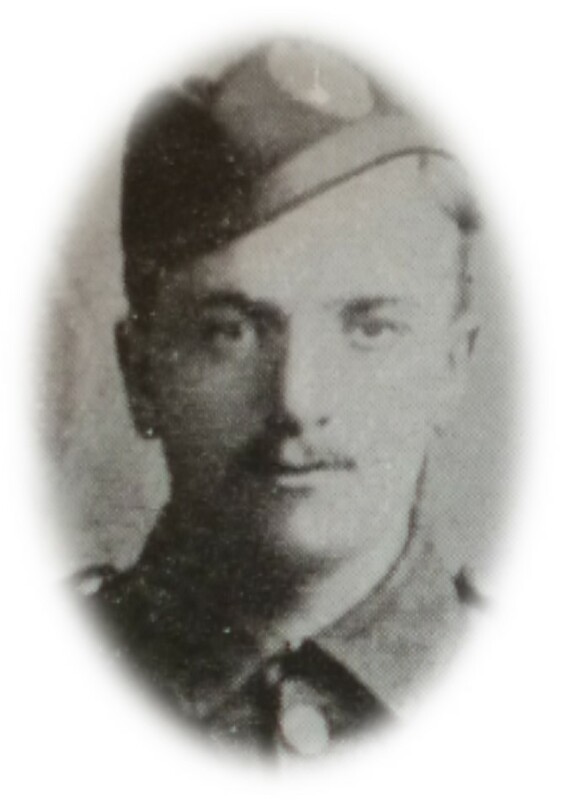 Private Alan Menzies as shown in Perth Academy’s school magazine, with thanks to the Local and Family History Dept, A.K.Bell Library, Perth for permission to reproduce it. Lance Corporal William Frederick Bennett, born around 1889 in Bridgwater in Somerset, had come to RBGE as a probationer gardener in August 1911 from Cardiff; missing, presumed killed in action. Private Alan/Allan Menzies, born January 1894 in Perth, joined RBGE as a probationer gardener in August 1913, missing, ‘presumed dead’. Lance Corporal John Stewart, born February 1891 in Alloway, Ayrshire, joined RBGE as a probationer gardener in August 1913, missing, presumed killed in action. Private George Hugh Stuart, born December 1891 in Dalry in Edinburgh, joined RBGE as an implement keeper in April 1914, killed in action. Update: 06/10/15: His family heard that he was last seen helping an officer out of a barbed wire entanglement when a German shell exploded next to them and nothing more was seen of George. Although gains were made on the first day, the Battle of Loos officially ended on the 8th October 1915 and is now considered one of the biggest disasters of that year with over 60,000 British casualties and ultimately no territorial gain. ** Thomas Angus, Duncan Coutts, James Grant, Robert Keir, James Reid and George Stuart’s brother-in-law David Oliver survived the Battle of Loos, although Coutts was wounded on the first day of the battle: a gunshot wound to his left forearm, fracturing his radius; and all but Coutts made it through the entire War, though most suffered wounds at some point. Short summaries of all the soldiers can be found in RBGE’s Roll of Honour available here or by contacting the RBGE Archives. One of these men was chosen by Isaac Bayley Balfour to have his name commemorated by using it to name a new plant – Primula menziesiana, a “charming little plant”*** collected by Roland Edgar Cooper in Bhutan in 1914, it was named after Private Alan Menzies to keep him in memory – which it has, despite the primula since joining its closest ally, Primula bellidifolia and taking its name. 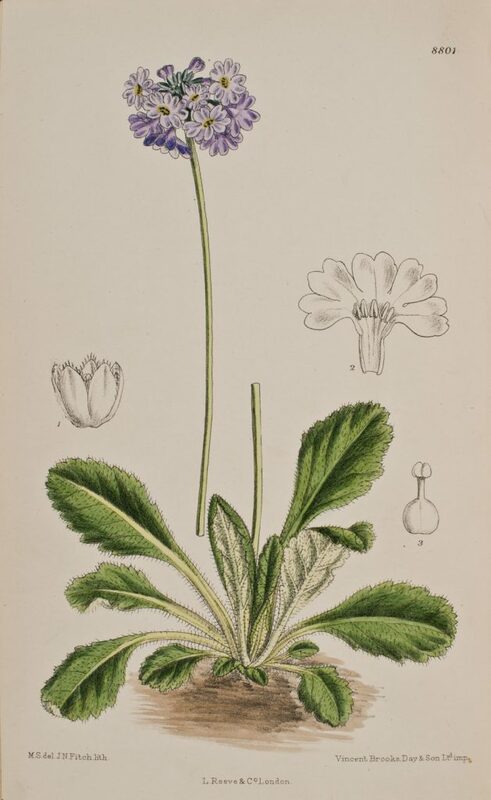 Primula bellidifolia from Curtis’s Botanical Magazine, 8801, v.145, 1919. R.E. 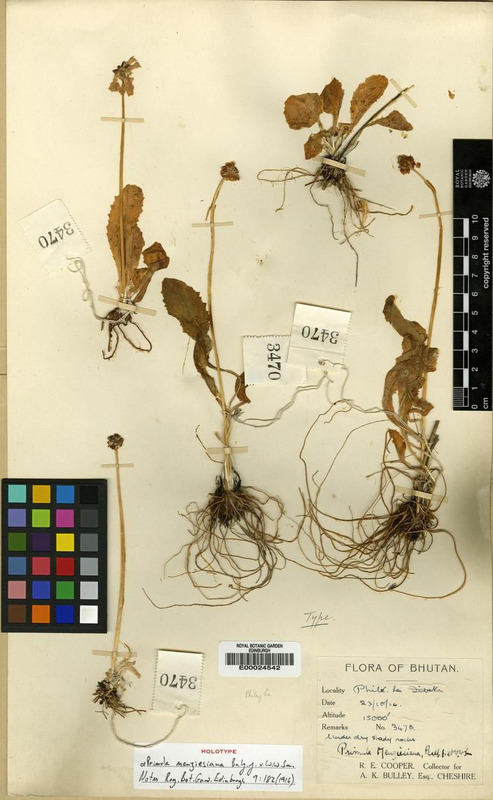 Cooper’s herbarium specimen of Primula menziesiana, collected in October 1916 under “dry shady rocks” in Bhutan. 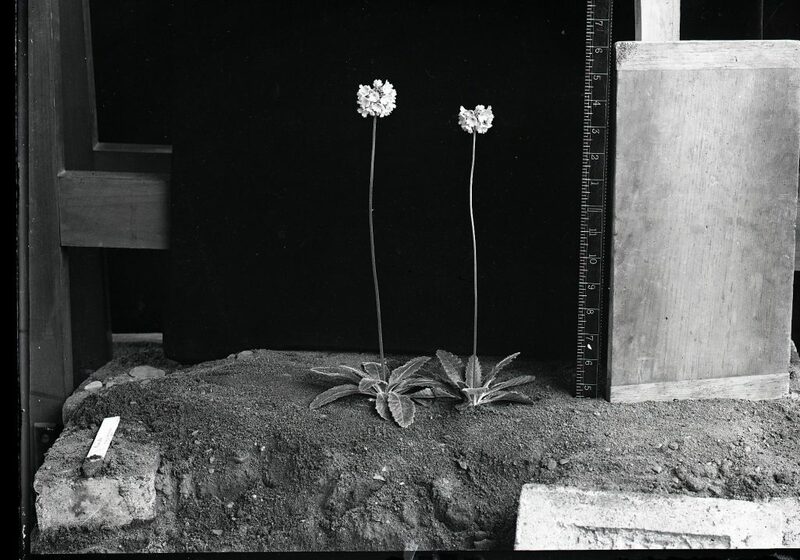 “Primula menziesiana: pot plant in flower” taken in the RBGE studio by Robert Moyes Adam, 7 April 1921. We’re off, a hundred thousand strong. And- some of us will not come back. He did his duty- and his bit! Poem by Ian Hay (John Hay Beith) (1876-1952) in his book “The First Hundred Thousand: Being the Unofficial Chronicle of a Unit of “K(1)”” (1915) – the name given to the first 100,000 men enlisted by Kitchener, of which the 5th Cameron Highlanders were part. The book ends at the Battle of Loos: [They] “will always be First; but alas! they are no longer The Hundred Thousand“. As ever, grateful thanks to Garry Ketchen for much of the background genealogical research, paving the way for mine; and to Dave Dykes and the pupils of Perth Academy’s ‘Flowers of the Forest’ project who helped with research on Alan Menzies and who located his photograph in the Local and Family History Dept, A.K.Bell Library, Perth. 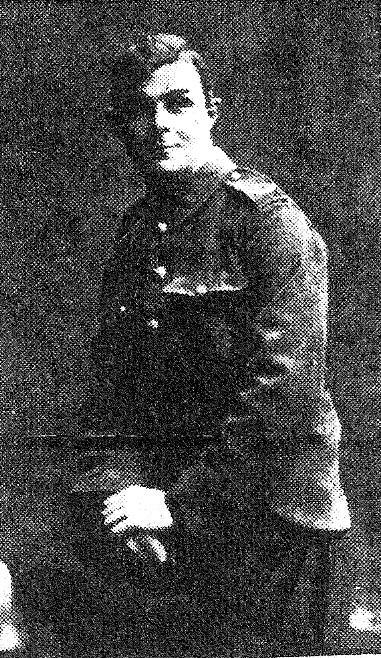 Update, 6/10/15: I’m also grateful to George Stuart’s great grandson Rob Stevens who made contact after reading this Botanics Story and was able to give me more information about Stuart’s family: “Sarah Stuart (nee Oliver) now found herself a young war widow with a small boy (also named George Hugh). She met and married one of the returning Australian soldiers who transited through Edinburgh on their way home. He then departed for Australia, Sarah & young George following on a few months later (with an aunt to look after her). They settled in rural Ballarat just outside Melbourne. Young George (my Grandfather) returned to UK, [at] about 14 I think and studied to be a Doctor. He joined the Navy during WW2 and served as ships surgeon in the Mediterranean. He then specialised as an anaesthetist, settled in Kent, died 1994.” He went on to have 4 children. Thank you for this. George Stuart was my Great Grandfather. I was at Loos last Friday (25th Sept) for the 100 yr anniversary with George’s Grandson & Great Granddaughter.